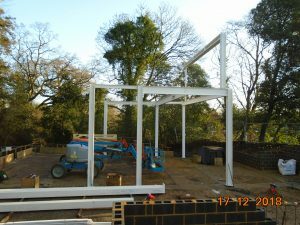 Most of the foundations have been completed and in mid-December, the steel frame construction has begun. Exciting progress ahead of the Christmas closedown. Good progress is being made on site, with Interserve now having removed much of the spoil from the site. A building update will be available for parents shortly. School mobile—for out of hours or in case no one answers. The new Tree Top buildings for Riverside are nearly complete. The final phase will be to install a footpath around the back of their buildings. This will separate access for the two schools and mean that Braywick Court will have our own enclosed footpath and playground with no shared usage, making it much safer for the children. Once we have had some rain and the grass has grown we will also have access to this as part of our outdoor play space. At last—the moment we have all been waiting for! Enabling works have begun this week at the permanent site! Thank you to everyone who came along to meet the contractors and look through the plans. Work will now begin over the summer holiday and we look forward to sharing more updates with you throughout the next academic year. We are pleased to say, that we are in the final stages of finalising the building works for the permanent new home for Braywick Court School’s new building. The plan is to begin the month long setup work for the construction of the building in the next few weeks. This covers the access road and work to the Nature Centre carpark as we have previously mentioned. This is due to start on 16 July and is a huge milestone in the long journey we have had to date. I am also pleased to say that positive progress is being made with the preferred bidder for the overall construction of the building, planned to begin as soon as the site setup work has completed. 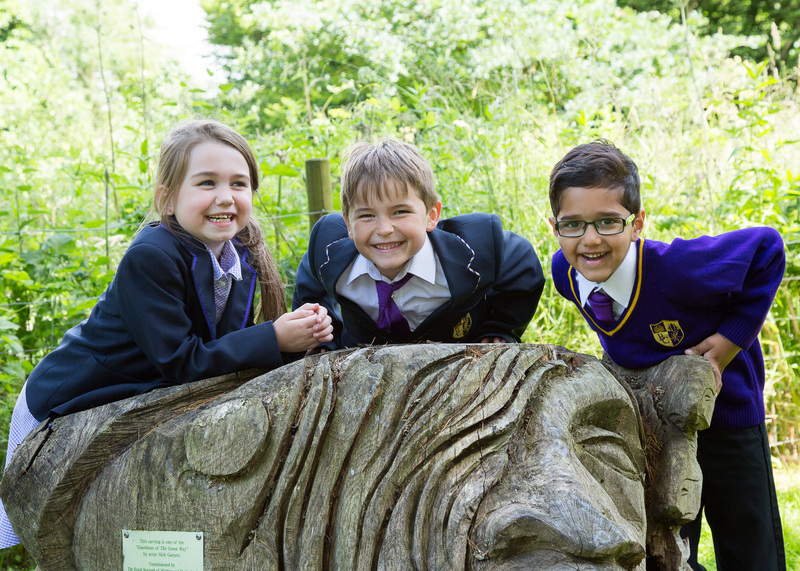 It has been a long journey for the school from its first opening in September 2014 and we know the children are excited to see what is happening in their new site, so we are planning on taking a school trip to the site on Thursday 19th July and invite you all to join us at 3.30pm. The preferred contractor will be there (who we will formally announced when the contract completion has been finalised) and you will have the opportunity to meet them, ask any questions, have a peep at the site and refresh memories by reviewing the new school plans. Mrs Donnelly and I were invited to a project overview meeting today, with the preferred contractor, architects, DfE and a whole host of technical advisers. Confidence in the project is high and all keen appointments, like a site manager, have been made to start enabling works on 16 July. Everything seems well placed to finally begin building works in this long overdue project. The Braywick User Group met with the Project Manager for the new Braywick Leisure Centre this month to find out about their plans. During the recent archaeological dig, some Saxon remains were found. This is very exciting for the archaeologists but very frustrating for the construction team. They now need to complete further investigations which will push back the start of the build by 8-10 weeks. This work has already started to take place at the back of the car park used for the bus, over by the old driving range. No machinery is allowed to move between 7 and 9am and they are aware of the health and safety considerations around children in the car park. Please do take extra care whilst the construction work is taking place. The soil being dug out is being stored on the field adjacent to our Park and Stride route and the amount which has been moved is already vast! Their current aim for a competition date is December 2019, although this may now be 8-10 weeks later. It is hoped that due to the significant changes at the top end of the park, including the leisure centre and building of Forest Bridge School, the Park and Stride car park and entrance road will be resurfaced. There are no firm plans for this yet but we have been told that it is under consideration. The last set of classrooms, which will be used by Riverside, are currently flying up. Their completion will make the whole space look neater and give us better access to more outside space, as we will have shared use of the school field with Riverside. The installation of the new gate and intercom, and reinstatement works to the grassed area outside of the classrooms, will be completed by the end of next week for our return after half-term. Good progress continues to be made behind the scenes for our new, permanent building. Contractual negotiations with the preferred bidder are ongoing and, as is always the case with complex projects being funded by the public purse, it is taking time to conclude. Enabling works (site set-up, construction of access road and pedestrian crossings) are scheduled to be undertaken between mid July and mid August. The main works will commence immediately afterwards, ready for completion in August 2019. Therefore it is still anticipated that the building will be completed in time for term to start in September 2019. No risks towards this timescale have been identified. Plans are underway for an event on Thursday 19th July, the last Nature Reserve trip for this year. The children and staff will be invited to meet the contractors, see the site and find out what will be happening over the summer as the big build commences. More details about this exciting event will be released nearer the time. In the mean time, Victoria Morris, parent governor, has kindly offered to discuss the current phase of the works and the building process, if any parents would like to discuss this and have been unable to speak to the Headteacher. It has been exciting to revisit the designs for the school, which provide excellent provision for high quality teaching and learning experiences. Some of these plans have been included on the following pages for your information. 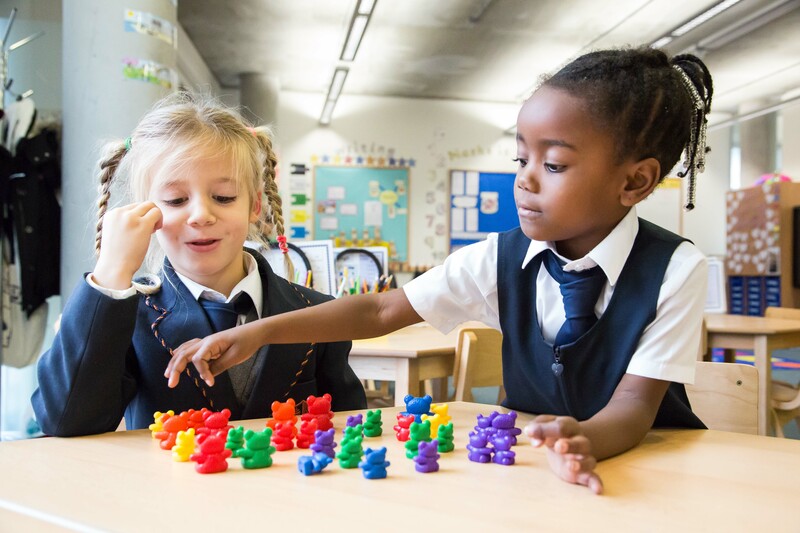 The school includes seven good sized classrooms, with Key Stage 2 (Years 3,4,5&6) on the upper floor. All classes have an outdoor area, including balconies upstairs. There is a hall, a catering kitchen, a library and lots of addition space for group work, meetings and offices. Extended Schools also has its own room, labelled as the Community Room. Structural engineers have been refining the fine detail of the plans for the building. This includes options of materials to be used on certain elements of the building, plans for drainage and floor coverings. We have also looked at IT solutions with Joskos, our IT provider and begun to look at plans for furniture, fittings and equipment. Caterlink have been involved in kitchen designs so that they meet their specific requirements for providing a healthy balanced menu for breakfasts, lunches and teas. BREEAM stands for Building Research Establishment Environmental Assessment Method. It is a sustainability assessment method. BREEAM rated developments are more sustainable environments that enhance the wellbeing of the people who work in them and help protect natural resources. Our new school will be targeting a BREEAM rating of very good, which is in line with our Green School ethos. This takes into account the climate of each space and includes elements like: amount of light, acoustics, heating and cooling. Also taken into account are energy ratings, water usage and ecology to name a few. The next stage of the process is for the preferred contractor to finalise their designs and proposals and return to the ESFA for approval. The program is scheduled to be updated in accordance with this by mid April and the next build update will follow the completion of this process. The contractor is well aware of the final deadline of September 2019 and financial penalties are in place if this deadline is not achieved. There is nothing in the program as it currently stands which creates a risk of not achieving this completion date. 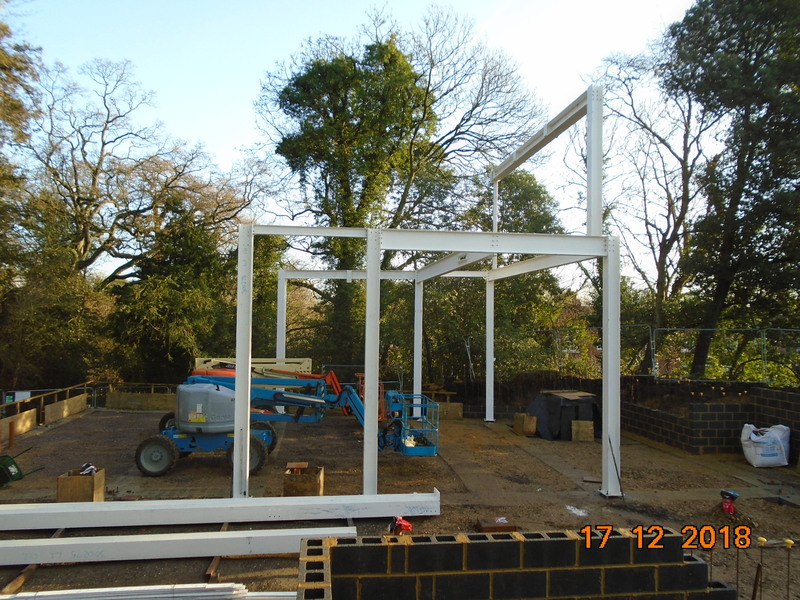 Excellent progress is being made on our new classrooms, with lots of hard work from Bridge Timber, who have not been caught drinking a single cup of tea, even at the weekends. We are on track for a handover at the end of February and are looking forward to getting in and using the new classrooms! The ESFA have received a competitive tender for our permanent site from a well known contractor who is on the ESFA Framework. The ESFA are currently completing the procurement process and appointment is due in March leading into a build programme that shows our school being ready for September 2019. Amazing progress continues to be made on the classrooms, which are now weather proof and even have windows! All is running to schedule and we look forward to moving in after half term. The canopies are now all in place and look fantastic! These have already been very useful in the wet weather but will soon be used for outdoor learning too. Tarmac and further resurfacing work will take place in our existing playground over the Christmas holidays. After this is complete the canopies, which have now arrived, can be erected. Demolition of Winbury House is now complete. Archeological trenching is now taking place and will be completed before Christmas. There have been no finds at the site to date. The build remains on programme. Ground work has started on site this week. Bridge Timber will commence the construction on site after the Christmas break. Riverside have moved into their classrooms now and they are looking great. We are looking forward to moving into ours in February. Bridge Timber have been awarded the contract for building the temporary classrooms at Riverside. This is the same company who have built the Riverside classrooms. They will complete the Riverside classroom within the next fortnight and then move across to start the one for Braywick Court. The Riverside classrooms have been built in 6 weeks and this should be the same timescale for our timescale too, although we do have to take into account the Christmas holidays. We had a very positive first meeting with Bridge Timber this week and good report about them from RBWM. We are looking forward to getting the project started and have already been choosing paint colours and flooring. Demolition at the permanent site has been progressing well and we have been watching it with interest! This photo was taken on Monday. This is the main building— just part of the Squirrel Classroom and the kitchen left standing. The classrooms for Riverside are very nearly finished and they are hoping to move in this month. This shows how quickly things can move once they get going and is very encouraging. As time progresses it looks less likely that our own classrooms will be in place for January and although the project team are hopeful of a completion by January, February is now looking more realistic. This work will take place over the next few weeks and completed before Christmas. Preparations for the new build continue to take place behind the scenes and the project remains on track for completion by September 2019. The planning application for the temporary buildings has been verified and has a decision date for the beginning of December. The buildings which are currently under construction are for Riverside as this was a separate earlier planning application. However it has been very encouraging to see how quickly they can be constructed once work begins on site. This project remains on schedule for delivery in time for January 2018. We are pleased to report that the bat conservationist have kept a close eye out and there is clear evidence that the bats are continuing to use the bat boxes. Now there is no roof to the building it does not provide a cozy home for the bats any longer so there is no concern about them moving back in! The demolition contractor met with local residents last week. The meeting was very positive and the residents are happy with the arrangements. They were encouraged to hear that a total of only eight or nine vehicle movements are planned for the whole demolition. The contractors will keep in regular contact with the residents and the Nature Centre. Demolition contractors are now scheduled to be on site on Monday, subject to the contract being signed. They will do two weeks of demolition, pause for archaeological trenching and then undertake a further two weeks of demolition. This will leave a flat site ready for construction to start.. This should be completed before Christmas. 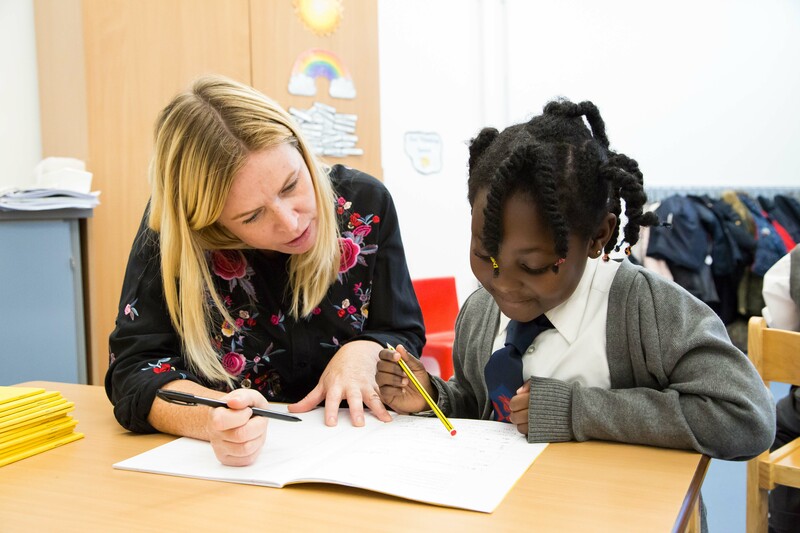 We are delighted to inform you that we have been successful in negotiating a significant funding increase, equating to one third of additional funding for the new permanent building for Braywick Court School. Overall, the letter provides detailed reassurance that the Government are committed to the building programme for Braywick Court School and the full commitment from the highest level, that the project will not slip any further. Demolition contractor appointed and due to commence in October. Invitation To Tender (ITT) for the permanent building contractor prepared and cleared to be issued to prospective building contractors. Suppliers for the units had a bidders day this week which was well attended, with six companies coming along for a site visit and two others also showing an interest. A pre-app letter has been received from RBWM and the application can now be submitted with confidence all issues have been covered. A communications leaflet will soon be distributed in the community and you will see these coming home in book bags over the next week or so. We are still being advised by the Technical Advisory Team that 3rd January handover is their deadline. We are pleased to inform you that the project is progressing well over at Hibbert Road. The contractor carrying out the demolition has been appointed and has been to visit the site and begin preparations. Demolition and site clearance will take place in mid October with our appointed contractor. The Trust and nominated governors will be meeting the contractors next week and a meeting will be offered to local residents. We look forward to being able to share photos of this work taking place over the next few weeks. We are thrilled to be able to announce that the budget for the full scheme is now in place and has increased significantly, meaning that the quality of the building will be ‘exceptional’. Work also continues to take place towards procuring a contractor for the main building scheme. This is being run alongside the demolition contract to help keep timescales as tight as possible. A parent has shared with us a copy of a letter they received from Peter Lauener, Chief Executive of the ESFA, to Theresa May, MP. This was in response to concerns raised by parents and shows a commitment from both the ESFA and our Prime Minister to keep the project moving and ensure its success. Woodford Interiors worked really hard on the playground over the summer. Children are enjoying the newly renovated playground, where the muddy areas have all be replaced with AstroTurf. Three new canopies are scheduled to be installed this month, giving the children the opportunity to take their learning outside. Maple class are using the Dinosaur Room as their classroom this term. Here is a photo of the transformation. A big thank you to Miss McFetridge, Mrs Nash and Miss Boycott who spent a huge amount of their summer holiday getting the space ready for the children. All funding has now been approved and is in place for the temporary classrooms to be placed on the field for Braywick Court School. The planning application process is underway and this week we have seen some progress as the fencing goes up ready for the foundations to begin to be laid! A demolition contractor has been appointed and remains on track to be on site by November, with demolition scheduled to take place before Christmas. As part of this process another archaeological dig has to be undertaken underneath the existing building, so cannot happen until after demolition. The road for construction vehicles will not be used for demolition so will not need to be in place until the build commences, which should reduce disruption for the Nature Centre and the local residents. The final date for completion of the build remains at September 2019.